Located in the middle of Phong Nha Ke Bang National Park and is roughly 12km from Phong Nha Tourism Center. Phong Nha Botanical Garden is an interesting touist destination in Quang Binh Province. This is a remarkable tourist spot for you when discovering a diversed floral and fauna system in Phong Nha Park. Experiencing the beauty of nature hidden in a tropical forest as well as trekking through forest and bathing in a cool stream will be unforgettable memories for you. Come and adventure a mystery behind the dark. Have you ever had mud bathing in the cave? Dark cave in Phong Nha is an ideal place for you. Ziplining 400m to the entrance of the cave and hamornizing yourself in a blue emerald water will be truly amazing fun for you. And kayaking on the river and playing some water sports on Chay river are some more activities waiting for you. In the morning we come and pick you up at the hotel in Dong Hoi or Phong Nha and then we start botanical garden – dark cave tour. The journey will lead us through rustic landscape of villages and on the legendary Ho Chi Minh trail. On arrival, the guide will briefly explain some pictures of eco system of Phong Nha National Park and show you some pictures of the war in Xuan Son ferry and Quyet Thang Road 20. You can share your feeling and respect hardship and endurance of Vietnamese people in the war. We then start trekk through small pathway of forest to end up at Gio Waterfall and enjoy bathing in a really cool water here. The tour then moves on by going through green nature of botanical garden and sometimes you hear some birbs singing. And we then stop and watch monkeys jumping from a branch to the others and follow with a visit t peacock farm and you take a rest and take some photograph. Eventually, we enjoy our time by resting and swimming in Vang Anh lake. The water is coming down from the hill top and has a good bathing lake and really beautiful nature setting. When you finish, we then walk back to the car and then we take you to dark cave. We enjoy lunch in a local restaurant and then explore the Dark cave. It is a perfect place for those who want to experience mud bathing and participating in some water sports on Chay river. First, we do ziplining 400m to the cave entrance and then walk in the dark followed by a mud bathing with some minerals good for your body. Then on the way out, we enjoy water sports on Chay river. Swimming in a fresh water and play voleyball with other guests will be exciting for you. Finally, you come back and bath with fresh water and then the tour will end here. We then take you back to Dong Hoi and Phong Nha. How special is botanical garden – dark cave tour? Joining in this tour, you have a chance to explore primitive beauty of forest in Phong Nha Park. Thus, botanical tour offers you trekking through forest and enjoy swimming in fresh water lakes. While dark cave helps you remove fatigue and strengthen yourself by a mud bathing and play exciting sports on blue water of Chay river. 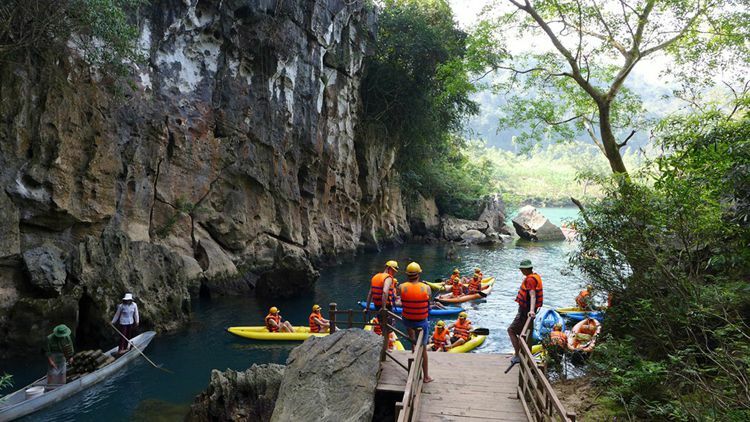 Moreover, 400m ziplining on a rope and kayaking on river will be special experience that no one does not want to miss when coming to Phong Nha Park. contact us at phongnhapioneer@gmail.com or call us at 0979613777 for more details. In case of bad weather, the tour will be canceled for the customers’ safety.